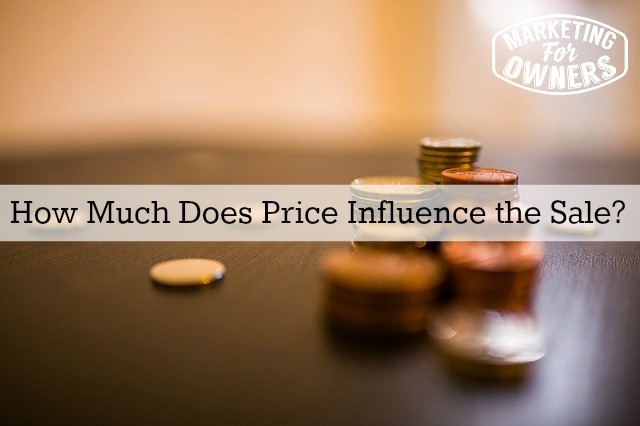 Now most small business owners are obsessed with price. We are not really obsessed but it’s like we think we can’t touch that price, or that’s a fixed price. You might even think you know what people are going to pay, or what people won’t pay, and that you can’t do anything about that. This is just not true and it is something you don’t have to worry about it. People are stuck with their price because they are scared. Now, generally it’s because it’s not salespeople and they’re not very confident. But price isn’t very important always to the customer. Now of course there are some things, if you are called Pound Land or a Dollar Store, of course price is important, but good luck with that model over the next 10 years. But if you want to be a discounter you’re going to struggle to make a profit because somebody will have deeper pockets and they will be able to make their product cheaper than you can, and your only option is to then be cheaper than them and rather than go out of business, they will try a last roll of the dice and undercut you. And rather than you go out of business, you will undercut them, and do you see where that’s going to go, so that’s not the way. But you think to yourself, “Well I can’t put it up, because everyone knows under £100, if I put it up to say £105, it’s only a fiver, but loads of people will leave because they will see the big difference. No, they won’t, because it’s the way you put it, it’s not the price, it’s what you are selling. People buy value; they don’t buy the price. If they are buying it by the price, go get some different customers that buy value. So let me tell you this –I have said this over and over for about 30 years — when you’re doing your service and there are others that do the same service, and you’re worried about competitors, only one of you is the cheapest. Is it you? Is it one of the others? If it’s one of the others, they’ve still got customers, if it’s you, have you noticed that they cost more than you and they still have customers? So, what are you telling me there? What are you saying to yourself? If it’s on price are you saying that their products are so much better than yours, their service is so much better than yours? Yours is so awful that customers are prepared to pay extra for theirs? I doubt it. Just think about it. You’re just scared, you’ve been stuck and you’re scared with what will happen. What’s the worst that can happen? A few customers drift away, you could change the price back and put it back down again. What do you know? But what you would find is that if you put your price up and then sell things on the value and the difference, your unique selling proposition, you can then put it up again and again, and again. That’s what’s important, is continuously getting the price up. For instance, say you start with the $99 price and you put it up, don’t go for $105 and don’t just round it up to $110 or $109, go for something unusual, go for $107.28. The people at the other end look like you’ve actually calculated that and you’ve not just pulled $99 or $110 out of the hat, there’s one little thing that always works. Apparently you will have forgotten that you used to sell it for $99, this stuff doesn’t work, people like to pay for expensive luxurious items if you are in the UK . If you go to Teskirch you will find they have Tesco finest, which is a luxury item, it’s the food. ‘m not making this up, they do, people will buy it because people want to aspire to looking and feeling wealthy, people prefer to buy stuff that makes them feel better about themselves. It’s not about you, it’s about them, it’s not about your product, it’s about them. You can Google everything about why put your prices up and read what others would have to say, but I guarantee I have done this over and over again and we are a discounter, and yet we still make a lot of profit. But we are a market on that is online, you know the cheap online price end of the market, but we purposely keep our prices above our competitors online so that we can say, well quite obviously we are not the cheapest because etc. Do you see how that’s going to happen? It’s really does work, just try it. It’s Monday and it is time for a book recommendation. 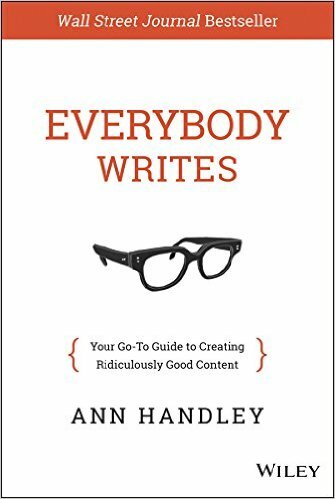 The book for the week is Ann Handley’s “Everybody Writes”. 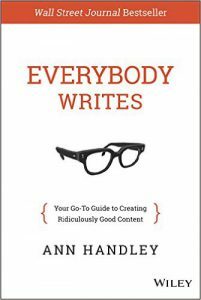 Now Ann Handley gets a second mention, there are not many, she joins people like Seth Godin who get on twice. She’s had submissions from writers as an editor for half her life, and she’s seen it all. But the great thing in this book is she doesn’t just tell you how to write, I mean you’re thinking, “Hang on, I’ve been to school”, she tells you how to write in our way, writing for business, what not to do. She also tells you how to tell the difference between the spellings of there and their, and here and hair and all that kind of stuff. If you’re not quite sure where to put apostrophes, she has little tricks on how to do that, if you’re not quite sure how to do it. It is one of the best books, I read it. I think last year on the way down to the skiing trip, it was one of the best books I read all year and some of the things in it I adopted for my own daily processes and I still do them today. Fantastic advice. “Everybody Writes”, Anne Handley. That’s it. All done. I’ll see you tomorrow.